Check out my new guide for starting your blog to learn how to go about properly creating your own blog. Somehow it looks like I missed covering this week’s topic. Considering how many e-mails I get about this, I don’t know how that happened. Some people may start out blogging specifically to earn some side income. Other people start a blog only to later find out that they could be profiting from it. Either way, the money isn’t just going to fall into your lap. You’ve got to put a plan in place and see it through. To help you get started on making money with your blog, here are some monetization methods you may want to consider using….or in some cases, steer clear of. Once upon a time Google AdSense was the best and easiest way to make good money from a website or blog. Eventually the gravy train fell off the rails as Google changed their terms to give publishers a much smaller piece of the pie. Mmmm gravy and pie. Oops, where was I? Oh yes, Google getting greedy and taking advantage of bloggers and website owners. Ok maybe they were actually making up for excessive click fraud with people faking clicks to make extra money. Regardless, AdSense simply isn’t what it once was. Google is giving publishers less money per click, but the bad press and the decreasing ad effectiveness has led to reducing their AdSense budgets. As advertising spending goes down, so does the AdSense income for publishers. Somehow despite how far downhill it has gone, I frequently see bloggers pushing AdSense in several prime ad spots. For a fraction of what an advertiser would pay for those spots, those bloggers are accepting cents to send traffic away from their blog. In my opinion if you’re accepting so little for those prime ad spots, you’re selling yourself short. Why not just try to keep those visitors on your blog if the click price is going to be that low? Verdict: Possibly worth promoting early on for a bit of easy money. Would be worthwhile for a blog in a less profitable niche with minimal affiliate options and direct advertisers. Think AdSense snuck in as deceptive links within your content. At least with AdSense you can ignore their ads if you want to. InfoLinks get up in your face with text links scattered all over your pages. That might not be so bad, but they show up in some rather awkward spots like headings, in your sidebar, in your footer and generally exactly where you wouldn’t naturally insert links. If you thought the AdSense income was low, you’ll be shocked by the prices that InfoLinks pays for clicks. Now compare that to the price that direct advertisers would pay for those kinds of text links. You’re sending away traffic practically for free. Is it worth deceiving your visitors for that chump change? Verdict: Only worthwhile if you’re desperate to make next to nothing. Think the frugalists that wash sandwich bags and patch holes in socks. These are the ads that you get paid based on pageviews rather than actual clicks. These do tend to be ads for big companies and the ads do usually look appealing. Again though, the money is not worthwile for most blogs. I admit I am prejudiced against CPM ads as I blog in the financial niche. With the amount of money you can make from direct advertising and affiliate ads, CPM ads are just wasting ad space in this niche. When I get offers for a few dollars for a thousand page views, I generally don’t bother replying. Again it’s just way too low to be getting paid to send visitors away from your blog. That being said, if you can generate a lot of traffic and you’re not focused on a particular niche, it is worth considering. You’ll need a LOT of traffic to do well with this approach, but sometimes you don’t have other options. In that kind of situation you would be best off doing some testing between CPM ads and something like AdSense. Verdict: Don’t bother if you’re in a profitable niche. It might be worth trying if you can’t do well with AdSense or other kinds of ads, especially if you’re not niche focused. These days this is the more controversial way to make money from a blog. This is because the advertisers generally want the kind of ads that will help their search engine rankings. Meanwhile Google doesn’t want it to be possible for companies to buy search engine rankings…unless they are paying Google for search ads instead. I for one don’t think Google has any right to tell people what kind of ads they can have on their blogs. When a search engine has such a massive monopoly, they do have the power to set such rules. So really you do have the right to sell this type of ad, but then you risk getting in Google’s bad books. Taking chance with the biggest potential source of traffic may be playing with fire. While the majority of direct advertisers are looking for text link ads, some do want graphic ads instead. As far as I know, these are acceptable to Google. You can also sell ads using the nofollow link attribute to be completely safe, but be sure the advertiser actually agrees to it. Verdict: For many bloggers the money you can earn from direct advertising is too good to pass up. It’s your call whether the risk is worthwhile. This monetization method holds a special place in my heart as I have had some success with affiliate promotion in the past. It’s like selling a product or service yourself without all the hassles of actually selling direct…stocking products, answering phone calls & e-mails, processing payments, after-sales support, reputation management, etc. Just ride the company’s coattails and benefit from their existing popularity and name recognition. You’ll find that many blogs start out going after the low hanging fruit such as AdSense and direct advertising. Eventually most seem to transition into affiliate promotion. There is just so much more money to be made without the risks. Those blogs are usually strong enough to get decent search engine rankings. So they can benefit from trying to convert extremely relevant traffic rather than trying to pitch products to your regular visitors. Promoting affiliate programs early on most likely won’t earn you much at all. Obviously people specifically looking for something are more likely to make a purchase compared to someone who just likes reading your blog. With affiliate marketing there are a wide variety of affiliate networks you can join to find suitable products to promote. For the finance niche I suggest you look into Commission Junction, Flex Offers, Credit Karma, Credit.com and Bank Rate. The established networks tend to offer the highest payout rates as they have the high volume to negotiate with advertisers. You can always go back and forth with multiple networks to try to get the highest rates. Verdict: Definitely profitable if your blog has lots of traffic or strong enough SEO to rank well. Might be worth avoiding early on as it usually doesn’t well with minimal traffic. This is a strategy that I have yet to attempt myself. I have seen numerous bloggers go this route though. It’s smart to offer your own product rather than relying on 3rd party companies that can interfere with your business. This is especially true for digital products like eBooks that can be sold without any kind of processing work required. When you’re selling your own product you don’t have to worry about a 3rd party changing prices, removing products or changing their terms and conditions. Eventually I will likely try putting together an eBook myself. It would be a lot of work, although I know some eBooks are simply a compilation of previously published content all bundled together. If I were to take the easy route, it’s more likely that I would just give away the eBook for free to help build up a mailing list. If you know how to make money from a newsletter, using an eBook to increase subscribers very well could be more profitable than just selling it on its own. Within an eBook you also have the ability to promote affiliate products. If you are able to do this successfully, there’s even more reason to just give away the eBook for free. You do have to be aware that marketing an eBook will take a bit of hustling. You’ll want to get in touch with all of your blogger friends to convince them to help promote the eBook. Perhaps you’d want to offer it as a prize in some giveaways for extra exposure. You might consider creating your own affiliate program on a site like ClickBank to try to recruit other people to promote your eBook in exchange for a share of sales generated. Another good idea is to get your eBook formatted to include on sites like Amazon. The trick on a site like that is doing what you can to get customer reviews for your eBook. Verdict: A solid option at any stage of the game. Could be used for direct income via sales or for indirect income via affiliate links and/or newsletter subscriptions. Here’s another monetization strategy that you could offer anytime, regardless of how established your blog is. Personally though, I suggest you wait until your blog is a little established first. That way it won’t be too much of a distraction from all the marketing and content writing that you should be putting into your own blog. Generally it is most common to see bloggers offering blog specific services. This includes things like staff writing, blog commenting and virtual assistant work. People with specialized skills can do especially well with offering their services for things like blog theme design, logo design, marketing services and blog SEO analysis. You could try being more creative and offer a service that may not be directly related to blogging but may still be useful to bloggers. If you’re going to offer paid services, you will want to try to get positive testimonials and people sharing your service by word of mouth. So be sure to put your best effort into doing that work. You could offer a lower price early on while you build up your reputation. You can post your service on a classified sites such as Bloggers Classifieds or on various forums. Again try to get your blogger friends to help out by mentioning your service on their blogs or on social media. Verdict: Can be profitable if you have time to spare, but many people would prefer a more passive blog income source while they focus on building up their own blog. Still it may be worth adding in for diversification. Realistically this is the area where my blog has helped me the most financially. Successfully running a finance blog played a big role in landing a website marketing gig for a finance company. I did have a lot of prior experience, but recent experience in a similar niche probably sealed the deal. Running this blog also opens up future employment opportunities for various company blogging and social media based positions. I have also seen numerous bloggers leverage their blog writing to become a staff writer at some very reputable publications. This is an especially strong option for bloggers who have a serious passion for writing. You can pursue something like this without worrying about aggressively marketing or monetizing your blog. In fact, a clean ad-free blog could actually make it easier to land such positions. By building connections within the blogging community, you might even get referred to a suitable job. This may be a little tough unless you are willing to relocate, but local bloggers could help out in that regard too. Verdict: This will probably be the least used way to make money from your blog in this list. It could very well be the most rewarding for those who take advantage of it. For most bloggers there comes a time when you just don’t want to or cannot continue blogging. If you’ve put enough work into your blog it could be a valuable asset to potentially liquidate. 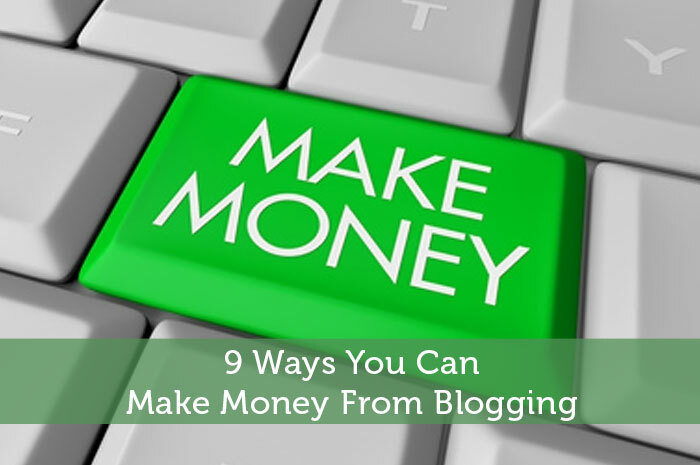 Sure you could earn more if you kept the blog going, but that isn’t always possible. Rather than just letting your blog collect dust, why not sell it to someone who can keep it going while also getting a nice chunk of cash. There are 2 classes of blog buyers. The first class is only interested in how much your blog has earned, usually within the last 12-18 months. These buyers only care if your blog has been proven to be profitable. Some of them may be more skeptical of income generated from risky activity like selling text link ads. The second class is more concerned with the future potential of your blog. They will base their pricing on stats such as PageRank, Alex Ranking, Domain Authority and monthly unique visitors. Buyers like that have confidence in their abilities to turn a decent base into something profitable. In some cases selling your blog can be extremely profitable. The top level finance blogs can sometimes sell for 6-7 figures. For that kind of payday it can be tempting to cash out and move onto some other project. I’m sure many bloggers have this kind of sale as a long term goal for their blog. Personally I’d probably be more likely to just shift into outsourcing the majority of the work and milk the blog income long term. Verdict: You might be disappointed by offers you get when your blog isn’t well established, but if you’re going to stop blogging anyway, get that money! Selling after your blog is very well established could make all of your work worth the time and effort. So there are a number of ways you can make money with your blog and these are just the more common methods. Remember that every blog is unique. You’ll want to test different monetization methods to find what works best for your blog. Be willing to give new strategies a chance if you hear that it is working well for other people. What monetization methods are you currently focused on? Do you have plans to shift to any other methods in the future? I agree, I don’t know how you didn’t do this one prior – but good post none the less. 🙂 I think you’re spot on about not settling for a smaller return with things like AdSense or Infolinks, especially as you start to get some decent traffic. I am doing a number of these and really focusing on affiliate (which I hope to increase with a newsletter starting next month) and other non-blog writing gigs. I think a lot of it comes down to creating as many streams of income as you feasibly can without stretching yourself too thin. I totally agree about the importance of multiple income streams. If you focus too heavily on one income stream, your income could be a lot less stable. With AdSense and Infolinks, I’m not really sure why people are willing to make their sites uglier for such low income. What an awesome list! This is a great source of information – I hadn’t thought of a few of these before. I really like the thought of creating an ebook. I know it would be a lot of work, but I think it’d be fun work! I’ll have to add that to my list of long-term goals. Thanks for sharing all these ideas! No problem Kali. Good luck with those long term goals. It does take a while to develop any of these income sources. As John indicated, it is all about diversity. I am working on different streams and leaving the cheap options off the table. That makes the most sense to me. No point in losing traffic to the low income options. I think with a lot of these streams of income it’s not necessarily an either/or proposition, you can make money from a bunch of them at once without necessarily cannibalizing the others. For example, I have Adsense and CPM ads both, and both do reasonably well. I also do affiliate sales, sell ebooks and offer my services through another site also. I like to keep my eggs in a lot of different baskets. Diversify thy income streams! For sure, you definitely want to combine several of these strategies together. I don’t think I’d agree about adsense and cpm ads though. For the low amount of money you’re making from those sources, you can instead be keeping people on your blog longer and stand a better chance of making money from them another way. When ad space is at a premium you want to use your most valuable spaces for more beneficial things. I agree that most people don’t make enough from Adsense and CPM ads alone to make it worth their while, it takes some time to reach a critical mass on traffic/etc to make enough. For me, however, Adsense and CPM ads are among the top money makers. I think one area that people sell themselves short in is by giving in and selling text links and other direct sold ads, that in the long run end up hurting them in Google’s eyes, but give them the short term income gain. That is true that a large traffic base sure helps with stuff like adsense and cpm. Still, in a profitable niche like this, I’m not sold that it’s the best use of ad space. With higher traffic levels there is even more potential for stuff like affiliate promotion. As for selling text links, I haven’t seen much risk there since all you stand to lose is your PageRank. So at this point it still seems to be a solid transitional source of income. This article could be re-titled for me as “9 Reasons I Will Be Keeping My Day Job” I find blogging is great as a hobby and perhaps more enjoyable that way too since one can focus more on the writing and less on the marketing. Awesome overview. I’m just beginning to look into how to make a bit more money from my blog. I didn’t want to push it too hard at the beginning, but I’m getting to the point where I believe advertisers would actually benefit from advertising on my site. Thanks for the details on how to make money and your opinions of each. I’ll keep all of these in mind. That is a good plan to not push ads too much early on. You do have to recognize the minimal benefits for advertisers early on. So if you ignore monetization early on you can focus more on content and marketing. Adsense CPCs have really gone down for me despite personal finance niche. I never liked Infolinks myself as it destroys the reader experience in my mind. The other problem with AdSense is that some advertisers just target specific sites. So that keeps ad prices down on the lower end sites. Affiliate marketing is something to aim for but it does take a while to build up. I haven’t added any advertising yet. I’m still working on building up my numbers so when and if I do add advertising – it’s worth it. Appreciate your insight, Jeremy. It makes a lot of sense to not rush into advertising in your case. With the books you write, you might as well build up exposure for those first. Great list and overview! So far Amazon Associates is working the best for me. I’m just a newbie though, so we’ll see what works best in the coming years. I also agree with Peter above – I think it’s best to have multiple income streams and not rely too much on any one source as the rules could be changed at any point along the way. Yes Amazon does have some solid options especially with stuff like book reviews. Peter does make a good point about diversification, but I’d be careful with trying to promote the low income stuff in conjunction with more profitable options. There are ways that you can set up your pages so that on certain categories the adsense or CPM ads don’t show, so that they don’t compete with articles promoting an affiliate, an ebook, or whatever else. Good idea Peter. With that in mind perhaps it would be worthwhile to run such ads on specific pages. I just started signing up for affiliate programs this week. We’ll see if anything comes in. I hope so! Just be patient with affiliate promotion. It is rare that a blog starts making money with affiliate ads as soon as they ad them to their blog. You need to figure out the best way to integrate them and it helps considerably to be getting search engine traffic. What a timely post Jeremy now that I am on self-hosted I can look at monetizing Canadian Budget Binder. Thanks mate. The new site looks awesome. Definitely a major upgrade. Now hopefully you can get making some money. Some days I’d love to sell it and I’d probably take $10! No, my blog is something I’ve grown attached to and I feel like for better or worse, I’ll keep doing it. It would be nice if traffic continues to grow so that I could make it more passive at some point. It is weird to think of life without blogging. When you put so much time and effort into something you do get attached to it. Good luck continuing to grow your blog to the point it’s making more passive income. Definitely saving this article for future reference! Haven’t monetized my blog yet, but when it comes time to do so, I’ll have this to help me out! I hope this post ends up being helpful. There are many different routes you can take with monetization when you are ready to make the move. I definitely want to get my blog to the stage where it can generate a decent side income. I may have to bookmark the series to try and improve my current process. Thanks for the information. If that’s your goal, be prepared to put in a lot of time and effort. Provided you stick with it, it isn’t too difficult to make at least some side income. I love all the articles you’ve been writing in this series! Very informative and helpful. My blog does not bring high traffic yet so that advertising would be profitable. Seems like the effort should be placed on growth and attracting visitors first. Is having Adsense on your site get one a boost in search rankings from Google though? There used to be some suspicion that this was the case, but I’m sure it’s been proven otherwise. There’s just too many low quality sites running adsense for it to be something that google would want to reward. Glad I’m not the only one who thinks this way. I’d think a lot of visitors wouldn’t like those kinds of ads. If you’re going to resort to infolinks, you might as well throw in some pop-up ads and pop-under ads. What a great series of posts! Just stared blogging myself and was in need of a comprehensive series such as this. Starting my blog with a full time 9 to 5 job is not easy, so I’m looking for the most efficient way to do things. I will start digging into these right now. Most bloggers do start their blogs in such an employment situation. So it definitely is possible. It does take some sacrifice to fit in enough time unless you are willing to be extremely patient with growth. Good luck Syed. I know of a lot of people that employe both direct ad sales and affiliate sales and are able to quit their day jobs just to blog. I wouldn’t trust that, because it can be unsustainable and unpredictable, but I do like that there is such diversity in the ability to make money from your blogging. It is rather risky to commit to relying on blogging income as your full time job. A lot of random circumstances could drastically affect your income. For people who do make that move, be sure you have multiple income sources, particularly some that are more stable. I think it’s a natural progression for most bloggers. You start out with the low hanging fruit for income, then move up the chain as your blog grows in popularity. Yeah that kind of approach is only natural. You might as well start getting some kind of income coming in to keep yourself motivated. Why $2.99? There were a few articles this week about data showing that prices above $2.99 do better than 0.99 or 1.99. I suppose if you’re going to shell out money, the psychological barrier has already been breached, so most people are less discriminating at that point. Thanks for that tip Jack. I really like that approach. It’s got me thinking that I should probably get going on something like that sometime soon. Unlike many people, I have had positive results from AdSense and I still consider them the best and easiest way to make money with your blog. My earnings, as well as CPC have increased since 2008 when I started blogging, so I can’t complain. I also did some really nice money with Infolinks: their eCPM is indeed very low, but if you manage to get a website with a ton of traffic, cents add up and you can make a little fortune. In the end, it’s all about trying and testing and seeing what works best for your blog. I guess it’s one of those situations where it may be your best option. Not every niche has affiliate programs that will do better than CPC and CPM ads. That’s awesome that you have found a setup that works well for you though. Direct advertising is really the best way to monetize your blog nowadays, that’s for me though. I think next would be affiliate marketing. It is one of the easiest ways for sure, but it does carry some risks. So you do want to work at building other more stable sources of income. This article was very timely for me. I was looking at ways to squeeze more revenue from my existing traffic, and based on your article I will test out affiliate ads. After direct product sales, Adsense has been the primary way to monetize traffic and has worked well. But it worked better in the past. My revenue per visitor has been dwindling. A/B testing is the best way to know for certain that one monetization strategy works better than another. The time is right to test affiliates against Adsense. I hope the affiliate ads win! Good point about A/B testing. That is something that way too few bloggers would try doing. You want to do proper testing rather than just switching things up and crossing your fingers. Good luck with your affiliate marketing. I’ve always planned on using AdSense since it seems so passive,but I’ve been hearing a lot lately that affiliate income is the real winner. Great post! I love blogging and I make money through affiliate marketing and offering my services. I haven’t had a lot of luck with AdSense but I know that a lot of bloggers do. I think what many bloggers forget is that this is not ‘easy money’. If you are looking to make an additional income from blogging you need to put in the effort, and these tips certainly will help people get onto the right track with it. Now I am thinking of getting more online income from other streams aside from the two that I have been doing for years. It’s always good to have fallback just in case I lose Adsense. Thanks so much for sharing this Jeremy. I’ve not tried monetising my blog yet but I intend to someday. I fall into the category of starting my blog as way of documenting my thoughts about debt and then realising I might be able to make money in the future! I’d heard rumours that Google Adsense wasn’t that profitable so it’s good to read about the other ways. I’d consider doing an ebook and I like the affiliate marketing method too! I have a comment related to your point on offering services. Locally, I am best known as the owner of a small web development company. I started this company for no reason other than I knew I had the skills to help small businesses establish a web presence at an affordable price. IF I KNEW THEN WHAT I KNOW NOW, I would tell myself to start a blog first. Learn/figure out as much as possible, and build a blog around what you’re passionate about. If you have the time/funds, start a podcast or a YouTube channel with even more great content. Just go all in with blogging and making the internet better as a whole. Once you have build this presence and a little bit of a community, this is the point where you should start seeking clients in web development and SEO. Sure, you’ll need to build up a portfolio of your work by offering your time for a reasonable rate which is exactly what I did anyways… but I personally believe this will help you elevate things to the next level at a more rapid pace. In a nutshell, I’m suggesting you center your web presence around your blog and creating value for your target market, and then direct potential customers to the services you offer. This being the opposite of what I believe most younger web developers do which is a set up a basic who we are / what we do website and trying really hard to get clients prior to building an audience and figuring out a lot of the things you can figure out through blogging. I can honestly say I have figured out so much more about starting and growing a business through blogging than I did actually starting my business, making my website, and getting a few clients as soon as I could. Thanks for this awesome blog post Jeremy! I liked it so much I shared it on my fanpage 😉 I do have also a preference for affiliate but also for ebooks.